Ladakh is one of those rare places that seems to have come only lately to the modern world. The women still wear the traditional dress, though the men are rapidly moving to western dress beneath the ubiquitous woolen robes. 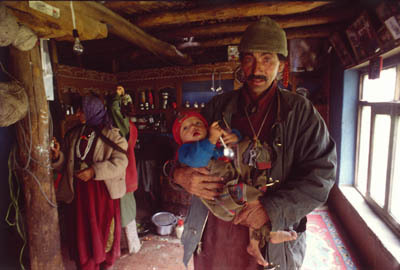 This man and child are members of the Dard tribe in Ladakh, India. It was winter in the Himalayas. I was in Ladakh, a geo political region in Kashmir where India was in conflict with Pakistan. I was there adding to my stock collection and shooting images for a “hoped for” book. Ladakh has a history closely intertwined with that of its neighbor, Tibet. They share a culture and way of life on the high Tibetan plateau. While most of India (80%) has the Hindu faith (worshiping a pantheon of Hindu gods the most popular of which is Ganesha) Ladakh is primarily Tibetan Buddhist. Ladakh is one of those rare places that seems to have come only lately to the modern world. The women still wear the traditional dress, though the men are rapidly moving to western dress beneath the ubiquitous woolen robes. But their way of life is still largely traditional, especially when one gets away from the capital, Leh. A third of the men become Buddhist monks and the ancient Tibetan monasteries can be seen hugging the steep slopes of the omnipresent mountains. The land has a harsh power and beauty to it in its desolate rocky landscapes and infrequent splashes of green where glacier run-off meets with suitably fertile soil. The landscape is indeed stark and rugged…and in the winter extremely cold! I was staying in a hotel, the only guest at the time (the Himalayas in the winter not being particularly attractive to tourists). I would watch out my window each morning as the hotel staff would chop a hole in the ice over an adjoining stream to get water to heat for my morning shower. 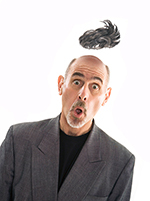 Well, not exactly a shower, more like a tepid sponge bath! In the 24 days I spent there I don’t think I ever did get really warm. Sometimes when we would stop for a photo op it would take all my resolve to get my camera and venture into the freezing wind. Often I would join my Sherpa guide, and a Ladkahi driver, to venture forth in search of photographs. Sometimes we would spend the night in villages. The drill was to find the local head of the village and request permission to stay there the night. Then a family would be pointed out to us and we would arrange to stay in an extra room for a small fee. The family would provide us with blankets and meals, sometimes literally cooked over Yak dung fire. One morning I awoke to find drifts of snow that had blown in between the cracks in the boards. At one point we stayed in a village populated with Dards, (descendants from, it is said, lost soldiers of Alexander’s army and the only Caucasian natives of Ladakh). The village was littered with piles of tubes each a couple of feet long. When I inquired what they were I was told they were shell casings from an artillery duel with Pakistan. When I awoke in the morning I wondered out and began to photograph a women in the act of collecting water with a jerry can. While doing so I was approached by a Lieutenant in the Indian army. He politely inquired what I was doing. Though it seemed pretty obvious to me, I equally politely answered that I was shooting photos for a planned book on Ladakh. He said that there was a small problem and that I would need to accompany him and his men back to his headquarters. Now normally this would not concern me…but in this case I was intensely aware of the fact that my visa for Ladakh had unfortunately expired and I was therefore in Ladakh illegally. The men drove me to their base. A small table was set in the center of the courtyard and a kerosene heater placed beneath it. Two chairs, one on each side of the table completed the arrangements. I sat opposite of the Lieutenant as he began to question me. “Why you shoot pictures,” he again asked me. The questioning continued for a while, punctuated with admonishments that I could not photograph in this “restricted area” without special permission. Apparently there had been some recent action (the aforementioned artillery duel) between the army and the Muslim insurgents and there was a lingering fear that the insurgents to identify military targets could use any photos of the area. The Lieutenant began to carefully examine each page of my passport. I held my breath. Something caught his eye. He looked up at me with an angry expression. “You write in pencil! Why you write in pencil?” he demanded angrily. He had come to the section of my passport where you write the name of someone to contact in an emergency. I answered him, somewhat relieved that he was not questioning my expired visa, “She is my girlfriend…girlfriends change! Upon hearing my explanation he burst into laughter. He called his sergeant to bring us tea. He asked me what I thought of India, and then launched into a long and impassioned discourse about how he was prepared to give his life for his country. As we finished the tea he warned me not to take any more pictures with the mountains in the background. I looked around me…the mountains surrounded us on all sides. I sheepishly agreed to his orders and he had his men drive me back to the village.